"Games by the People, for the People!" 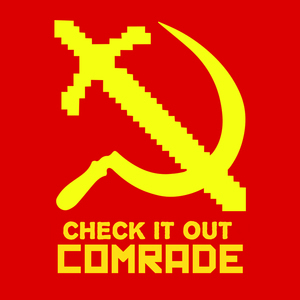 Check it Out, Comrade! is an Indie Game review podcast hosted by Nick Glauber. A short and sweet look at two indie games every two weeks, with separated spoiler sections so you can hear as much or little as you choose. Gary Butterfield hosted the show with Nick, up until episode 79 The Flame in the Flood and HEARtREAD, when he announced he would take an indefinite hiatus to focus on writing his second book in the Worlds of Power series, Atomic!. Brayton Cameron took his place the following episode, until he to had to leave on episode 87 West of Loathing and Subsurface Circular. Nick put the show on a hiatus to think of where to take the show next. 12 Escape Goat 2 and Goat Simulator April 19, 2014 Goats Special! 24 In The Kingdom and Five Nights At Freddy's Oct 18, 2014 Halloween Special! 31 Powercycles and Tea Leaves January 31, 2015 Twine Special! 42 Towerfall Ascension and Duck Game July 18, 2015 Guest: Brayton Cameron, with Video!